Death and degradation are not the end: the dreamworlds of Bill Morrison. Anyone familiar with celluloid film on a personal level will understand that, even now, it’s fragile stuff. Accidentally flash it while loading the camera and you’ll lose a few frames; leave it unsecured and it’ll scratch; forget it in a damp or hot cupboard and it will distort and warp. In this age of digital cinema (which, contrary to popular belief, has its own forms of decay) we are leaving a delicate era behind us. But delicate as it is now, film used to be more than fragile – it was explosive. The first celluloid – nitrate film – was composed of the same basic materials put into munitions and weapons of war. As a result it was incredibly flammable, even mild friction or heat being enough to cast it up in flames. This is partially the reason why it’s estimated that 75-90% of all silent films are now lost. Countries prone to earthquakes, like Japan, are likely even worse off. But for all the films lost to time, there exists a middle-ground that are, if this makes sense, mostly lost. They survive in some physical form, but are so warped to be unwatchable by any reasonable standard. Whatever the images once represented is lost to the murk of time, the remains a strange, fractal pattern. 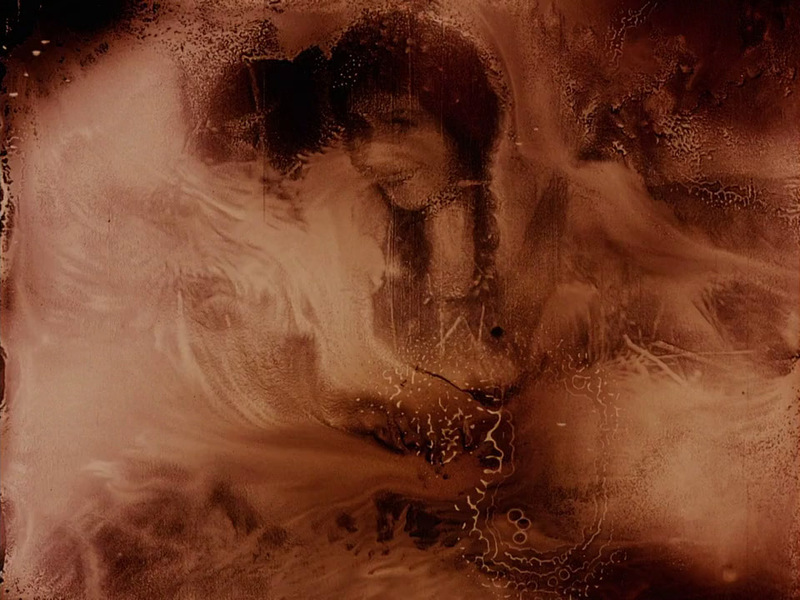 Something like a Brakhage short. One filmmaker, however, sees in these remnants something more. Bill Morrison, a leading figure in the American avant-garde, restores these lost films despite their clear damage. In fact, it is because of the damage that his work takes on such an interesting dimension. In his Light is Calling we watch a lover and her beau meet in the countryside, or we try to. Hidden behind years of decay, ghostly memories phase in and out of vision. Echoes of lost time. His cinema is not, or at least not solely, an intellectual activity. Light is Calling is taken from The Bells, a 1926 film for which no undamaged copy remains. As such, this is more than an aesthetic experiment. It is the last, fading glimpse of another time, of a piece of art. As beautiful as the restored distortion appears, it carries the sadness of loss. Clarity becomes an impossible dream. A nostalgic feeling abounds, like a half-remembered evening, the details lost or imagined. Morrison’s cinema suggests two practical responses. One, more obvious, is the importance of archiving. That some of the world’s beloved classics might have met a similar fate as The Bells is unsettling. And that many films that would’ve been beloved classics have been lost is nothing short of a tragedy. But the other is perhaps more optimistic. That even in detritus and decay, these films are not totally damned. Phantoms, perhaps, shades of themselves. But in their whispered and crackled monochrome, still moving audiences and onlookers. A bleached and hallowed after-life for cinema’s forgot and forlorn.